Dulwich Sash Windows specialises in fitting, renovating and draught proofing sash windows to the highest standards. 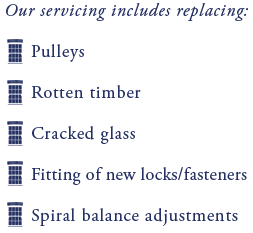 Whether you require complete box replacements, double glazing for your existing boxes, draught proofing, repairing or repainting - we provide the full sash window service. Our comprehensive sash window experience allows for worry free maintenance or replacement of sash windows on listed buildings, period properties or even new-builds.